In the first week of March, hundreds of social work educators from across the US will come together in New Orleans to discuss the future of social work education at the Association of Baccalaureate Social Work Program Directors (BPD) conference. It is clear that the stakes for social work education are higher now than ever before. For my students who are working in field placements in health, education, and social services sectors, there is a growing sense of dissonance between the values of human rights and human services on the one hand, and bottom-line, outcome-driven work environments, on the other. This dissonance is exacerbated by the current toxic political discourse and demoralizing regressive social policymaking, coupled with the excitement of heightened grassroots social movement resistance. For me, the salient question is — how can we provide students not only with the critical thinking skills to de-construct the contradictions before them, but to invite them to bring their whole selves, such that they can be more resilient, and ultimately be personally and collectively empowered to effect change? In order to face the challenges of the 21st century, we must invite our students into an opportunity to change the existing paradigm and to co-produce real solutions. The challenges we face are indeed daunting – the human fallout of hypercapitalism, racism and xenophobia, privatization of public services, environmental devastation, digital age stress, and health disparities. It is our job as educators to tap into human strengths, including our capacities for presence, intuition, empathy, critical analysis, and persistent action, in ways that have the potential to transform individuals, communities, and systems. This means that educators must craft experiential learning opportunities that help students understand and reflect on their own relationships to these issues and all of their complexity, in addition to imagining and embodying new solutions in the classroom and field. It is clear that social work practice and education in the 21st century demand new innovations, actions, and risk-taking. We can draw inspiration from a global movement of educators who believe these transformational processes can be nurtured in the classroom through deliberate cultivation of deeper levels of mindfulness, discourse, and human connection. This necessitates participation of the whole self in relation to other whole selves in the context of the environments we inhabit. Such processes and practices require the creation of trusting, compassionate relationships within the classroom community so that students feel safe enough to get uncomfortable. These processes are necessarily visceral as we help students to cultivate a connection with a felt sense of the body-mind-spirit across differences. By engaging holistically in the classroom, student social workers can take their new insights and skills into the community. Educators need supportive communities of their own to learn from, be motivated by, and to lean on. This transformative work asks us to be in an ongoing critical conversation with the current social work and educational environment, particularly the impacts of globalization, the commodification of social services and social work education, diversity and growing awareness of non-western cultural and healing practices, as well as the causes and consequences of maladaptive coping. To sustain this conversation in the classroom and the community, we need skills for nurturing our relationships and ourselves. Based on my experiences working with social workers and activists both in the community and in the classroom, I believe we need to develop a sustainable and integrative capability to be responsive in real time, inviting learning and growth throughout one’s career. Such a capability can be cultivated by teaching mindfulness, conscious communication, self-care, and empathy across differences. In my collaborative work with educators from around the world, I’ve met inspiring social workers who are drawing from the works of Paulo Freire and Augusto Boal, and employing modalities such as theater of the oppressed, mindfulness, t’ai chi, and integrative mind-body-spirit social work to move students toward greater self-awareness, wellbeing, and group empowerment. These educators are also addressing the institutional barriers they have faced in implementing such pedagogies in institutions that are arguably set up to perpetuate patriarchy, positivism, and disembodied “diagnose and treat” interventions. Our students are hungry for authentic and radical human connection, as they learn to hold complexity en route to effective change making. To be able to do this work, educators need supportive communities of their own to learn from, be motivated by, and to lean on. We can do this by convening skill shares, reflective communities of practice, and conferences like BPD, poising social work educators to revolutionize social work education and to actualize our shared visions for social justice. Come and visit Oxford University Press at BPD at booth 206! Featured image credit: full frame shot of stadium by johnyksslr. Public domain via Pexels. Loretta Pyles, PhD, is Associate Professor in the School of Social Welfare at the State University of New York at Albany. 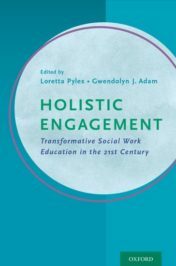 In addition to co-editing (with Gwendolyn Adam) Holistic Engagement: Transformative Social Work in the 21st Century (Oxford), she is the author of Progressive Community Organizing: Reflective Practice in a Globalizing World, 2nd ed. (Routledge, 2013), the forthcoming Healing Justice: Holistic Self-Care for Change Makers, and the forthcoming (with Juliana Svistova) Disaster Industrial Complex: Disaster and Recovery in Haiti (Routledge).